An exclusive benefit for WBE Canada-Certified WBEs, our WBE to WBE 1:1 MatchMaker event is designed to help connect women-owned businesses with larger WBE buyers. If you are looking for Tier 2 or Tier 3 opportunities, this event is perfect for you. For eligible WBEs, 1:1 MatchMaker Meetings provide an incredible opportunity to meet one-on-one with buyers from larger WBE businesses who are seeking to support other WBEs and are specifically interested in their services. For larger WBEs, the 1:1 MatchMaker event offers a streamlined and efficient way to meet dozens of innovative women-owned businesses based on your procurement needs, all in one sitting. As a participating WBE buyer, you will schedule 1:1 MatchMaker Meetings with our team, making the conversations and connections targeted and specific to your procurement needs. Please note: Eligibility for MatchMakers does not guarantee a WBE supplier will be selected for a meeting; meeting selections are based upon buyer needs. All WBE Canada-Certified WBEs with an active certification are encouraged to complete their company profile in our database. Once completed, each company will be included in the 1:1 MatchMaker selection process conducted by WBENC National Corporate and Government Members. Unfortunately, due to limited meeting time slots per corporation and the specific needs of the participating corporations, not every eligible WBE may receive a meeting request. 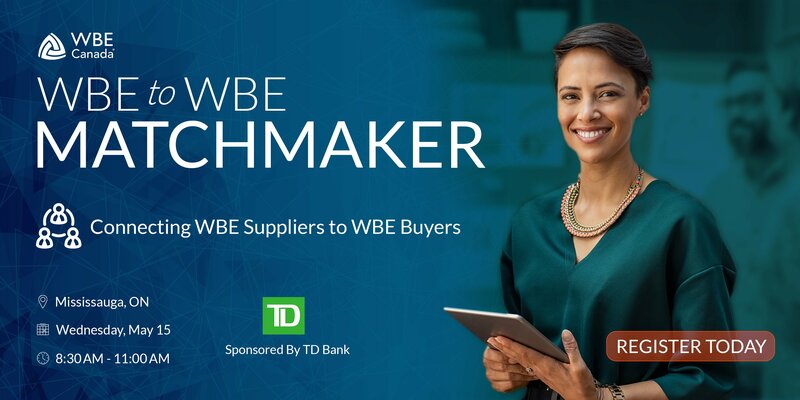 March 31, 2019 – Deadline for WBE Buyers to confirm their commitment to WBE 2 WBE Matchmaker. This is a closed-door event for Certified WBEs only! You MUST have an active match to attend. Seats will be awarded on the first come first served basis. Check our Events FAQ Page for more information!